It's time to celebrate Cinco de Mayo! A small dog race, free tacos and sizzling performances are a few of the things people can expect during this Cinco de Mayo holiday weekend. Cinco de Mayo is commonly known for enjoying discount margaritas at Happy Hour while eating delicious Mexican tamales. But did you know there are tons of Cinco de Mayo events and activities around our area for the entire family to enjoy? Local businesses are also offering plenty of specials for people to enjoy. Running of the Chihuahuas: The second annual Running of the Chihuahuas is deemed “D.C.’s funniest Cinco de Mayo celebration.” The race benefit’s PAWS Southwest, a non-profit group building a dog park in Southwest. Besides the Chihuahua race this family friendly event will feature food trucks, contests for best-dressed dog and best trick, music, and a beer stand. 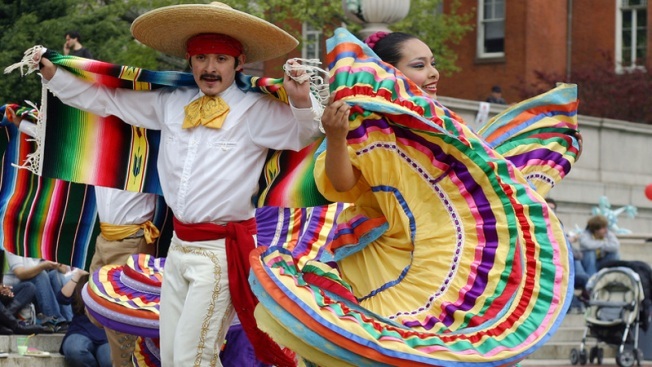 Date and Time: Saturday, May 4, 11 a.m.-2 p.m.
National Cinco de Mayo Festival: The annual free festival explores the rich history of Latin American and features children’s arts and crafts workshops, live music and food. Hosted by the Maru Montero Dance Company, visitors can expect Mexican folk, salsa, and tango performances. Date and Time: Sunday, May 5, noon-6 p.m. Location: National Mall between 8th & 12th streets. Get off at Smithsonian Metro station. California Tortilla (multiple locations in D.C., Maryland and Virginia): When you buy an entrée at California Tortilla May 3-5, you will get a coupon for a free taco to use on your next visit. Wine-a-ritas at Veramar Vineyard: Close to the Shenandoah Valley? Celebrate Cinco de Mayo with Veramar’s famous wine-a-ritas. The $16 admission fee also includes two tacos. Date and Time: Saturday, May 4, Noon-4 p.m. Location: 905 Quarry Road, Berryville, Va. Reservations required. Guacamole Festival at El Centro D.F. : Taste regional guacamoles such as the tradicional (made with avocado, tomato, onion, cilantro and chile serrano) and the Baja (with kiwi, jicama, strawberry, mango, mint, chile arbol, lime and sea salt), plus cocktail specials. Date and Time: Now through June 30, 5-11 p.m.
Cinco de Mayo at Dirty Martini: Go for drink specials (including $4 tequila shots; $5 margaritas and $4 coronas), DJ-spun tunes, $3 tacos and $6 quesadillas. Date and Time: Sunday, May 5, 5 p.m.